1. 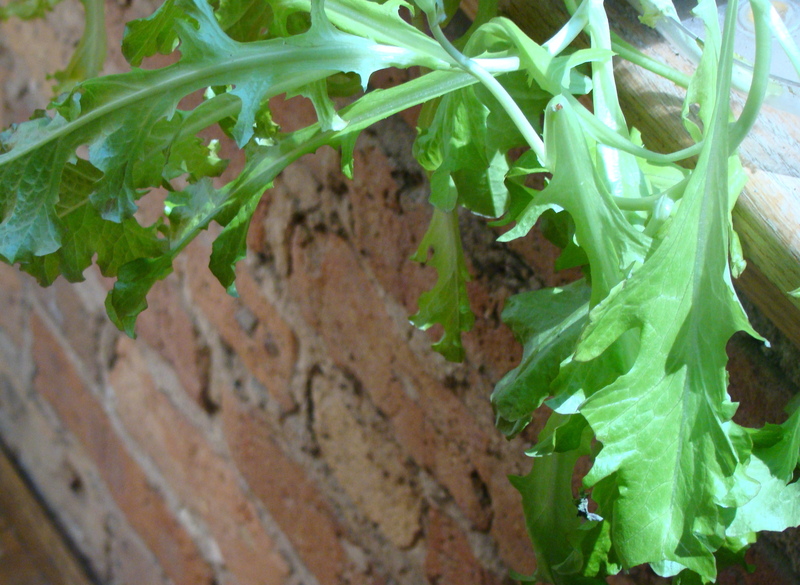 The lettuce I’ve been growing inside on a windowsill is overdue for harvesting. (I don’t think it’s supposed to look like a hanging plant.) So, it’ll get snipped down and become salad this weekend. 2. 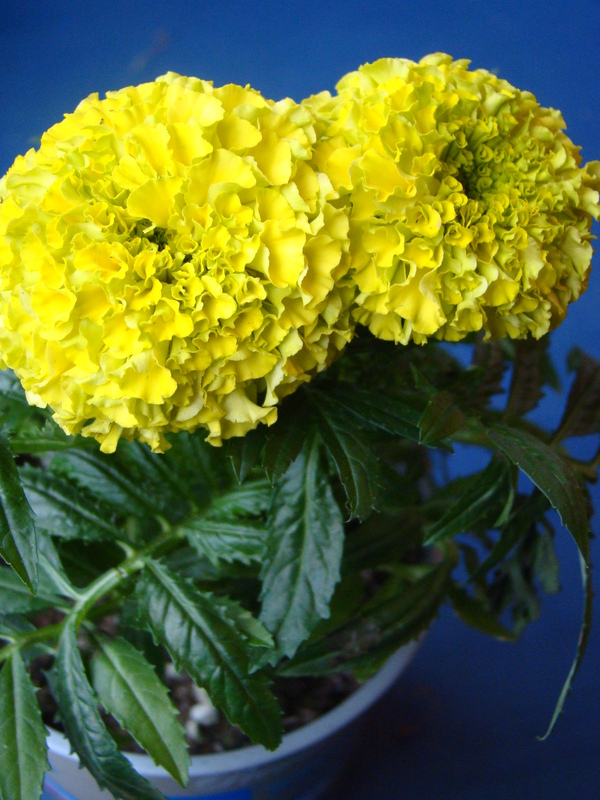 I picked up a fun little yellow marigold that I liked because it looked as though it was edged in green. It’s a subtlety that lends a unique aspect to a common garden flower. I place marigolds in the planters with my herbs and nasturtiums because they, too, are edible. 4. This annual with blueish purple blooms caught my eye, but wasn’t tagged with plant name or instructions. Let’s hope it likes full sun. Does anyone recognize it? Really cool. I like the SP project the most. Your purple annual appears to be a scaevola. I have a white one on my front porch. I love how the flowers look like fans. I think you’re right! 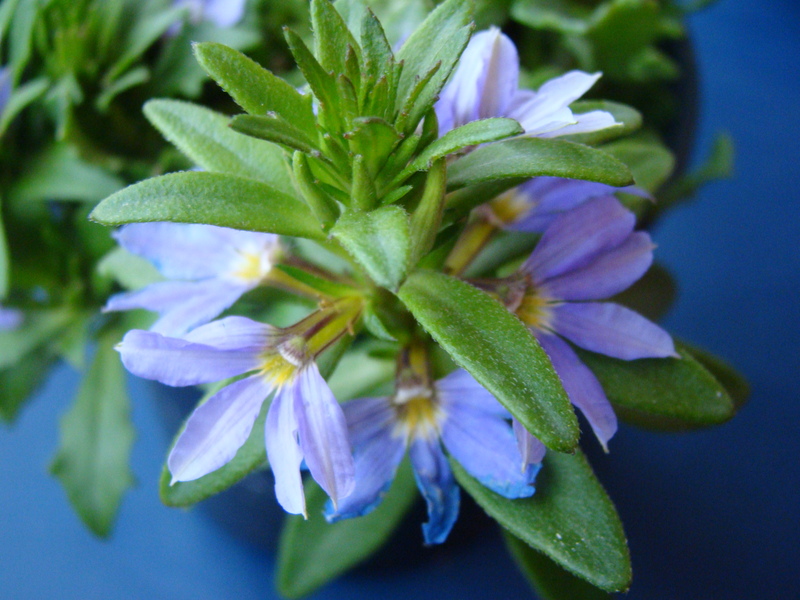 I Googled images and scaevola looks like what I have. And it seems that it likes full sun! Thanks! I’m enjoying the sweet potato experiment. Takes me back to 8th grade science projects. 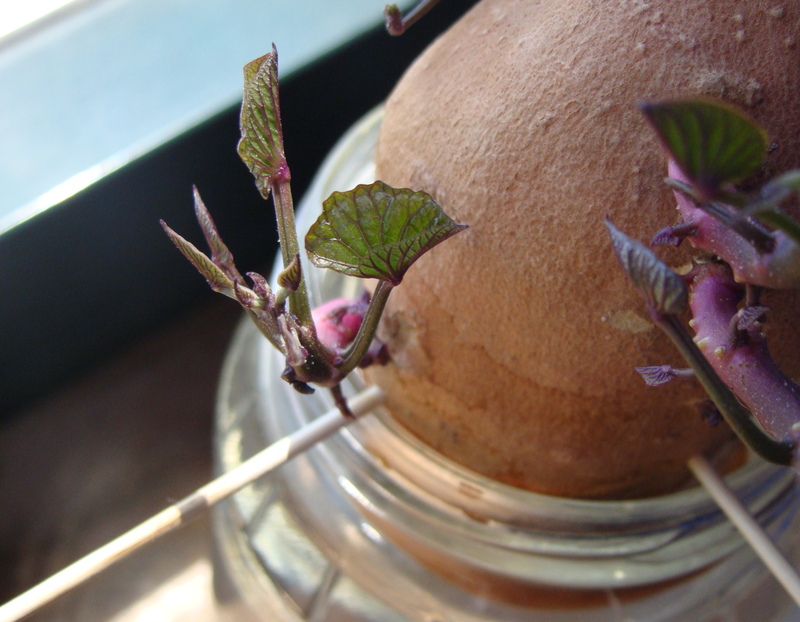 I might try growing potato vine once I found one good potato to grow 🙂 I like this project! Very interesting and economical. Btw, some seeds I sowed the other day, got eaten by tiny snails that came with the soil. But, this makes gardening more fun! If they don’t grow now, we can always try again. And, I always believe that plant can fend for themselves pretty well. They will get better once the sky is clear. Have another great day! Btw, it was good to hear from you in my blog 😉 TQ for your time. I agree with you that the snails are just a cool new learning experience. I’ve had birds nibble on my young nasturtium sprouts and still managed to have enough survive for a healthy crop in my planters. And I love visiting your blog. You are so knowledgeable about plants! Cheers! Birds come to nibble on my new sprouts too! Yeah, I really hope some will still survive after all. Actually, I learn as I blog and garden each day. Avis, I love visiting your blog too. I have learnt much about culinary herbs like basil, flower colours, lavender sugar etc from you. TQ! It’s cold here too! Oh well, if gardening didn’t have its challenges, it wouldn’t be any fun, would it? We’ve had some lovely weather over here over the past couple of weeks, however, over the last few days it’s gone back to that usual rainy UK weather. Still, the plants are enjoying it. 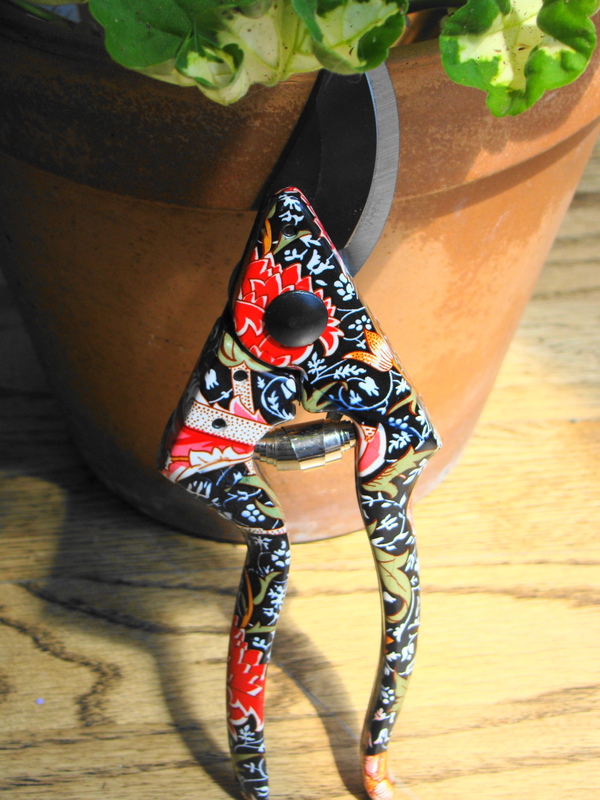 Avis, thanks for the secateurs shout-out! They look SO stylish… I’m glad you’ve already been able to put them to good use. I knew they’d make a better gift to you than another bottle of wine!